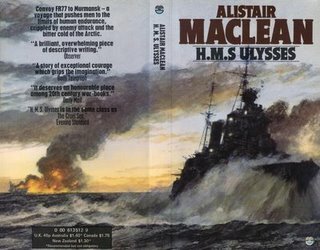 Following on from yesterday’s post about the Arctic Convoys, here is a review of HMS Ulysses by Alistair Maclean which I found on another wordpress site. Most war or action novels have a few things in common : A handsome hero who can shoot you between the eyes with his left hand while he lights a cigar with his right, a funny sidekick who never ever tries to steal the limelight, a pretty girl who is in serious and frequent need of rescuing, and plenty of ugly, stupid bad guys. My favorite one of all time (and I assure you, I’ve read a lot), however, involves a single warship at sea. The handsome hero is missing, so are sidekicks and pretty girls. The bad guys are not ugly or stupid at all. They are menacing, ruthless and brilliant; and they manage to outfox the good guys at almost every turn.